A drawing of the object created by witness Tim Ley appeared in USA Today. The Phoenix Lights (sometimes called the "Lights over Phoenix") were a series of widely sighted unidentified flying objects or UFOs observed in the skies over the U.S. states of Arizona, Nevada, and the Mexican state of Sonora on March 13, 1997. Lights of varying descriptions were seen by thousands of people between 19:30 and 22:30 MST, in a space of about 300 miles (480 km), from the Nevada line, through Phoenix, to the edge of Tucson. There were two distinct events involved in the incident: a triangular formation of lights seen to pass over the state, and a series of stationary lights seen in the Phoenix area. The United States Air Force identified the second group of lights as flares dropped by A-10 Warthog aircraft that were on training exercises at the Barry Goldwater Range in southwest Arizona. Witnesses claim to have observed a huge carpenter's square-shaped UFO, containing five spherical lights or possibly light-emitting engines. Fife Symington, the governor at the time, was one witness to this incident; he later called the object "otherworldly." The lights were reported to have reappeared in 2007 and 2008, but these events were quickly attributed to (respectively) military flares dropped by fighter aircraft at Luke Air Force Base and flares attached to helium balloons released by a civilian. At about 18:55 PST (19:55 MST), a man reported seeing a V-shaped object above Henderson, Nevada. He said it was about the "size of a (Boeing) 747", sounded like "rushing wind", and had six lights on its leading edge. The lights reportedly traversed northwest to the southeast. An unidentified former police officer from Paulden, Arizona, is claimed to have been the next person to report a sighting, after leaving his house at about 20:15 MST. As he was driving north, he allegedly saw a cluster of reddish or orange lights in the sky, comprising four lights together and a fifth light trailing them. Each of the individual lights in the formation appeared to the witness to consist of two separate point sources of orange light. He returned home and through binoculars watched the lights until they disappeared south over the horizon. Lights were also reportedly seen in the areas of Prescott and Prescott Valley. At approximately 20:17 MST, callers began reporting the object was definitely solid, because it blocked out much of the starry sky as it passed over. John Kaiser was standing outside with his wife and sons in Prescott Valley when they noticed a cluster of lights to the west-northwest of their position. The lights formed a triangular pattern, but all of them appeared to be red, except the light at the nose of the object, which was distinctly white. The object, or objects, which had been observed for approximately 2 to 3 minutes with binoculars, then passed directly over the observers, were seen to "Bank to the right", and then disappeared in the night sky to the southeast of Prescott Valley. The altitude could not be determined; however, the object was fairly low and made no sound whatsoever. At the town of Dewey, 10 miles (16 km) east of Prescott, Arizona, six people saw a large cluster of lights while driving northbound on Highway 69. Tim Ley and his wife Bobbi, his son Hal and his grandson Damien Turnidge first saw the lights when they were above Prescott Valley about 65 miles (100 km) away from them. At first, the lights appeared to them as five separate and distinct lights in an arc-shape, as if they were on top of a balloon, but they soon realized that the lights appeared to be moving towards them. Over the next ten or so minutes, the lights appeared to come closer, the distance between the lights increased, and they took on the shape of an upside down V. Eventually, when the lights appeared to be a couple of miles away, the witnesses could make out a shape that looked like a 60-degree carpenter's square, with the five lights set into it, with one at the front and two on each side. Soon, the object with the embedded lights appeared to be coming right down the street where they lived, about 100 to 150 feet (30 to 45 meters) above them, traveling so slowly that it appeared to hover and was silent. The object then seemed to pass over their heads and went through a V opening in the peaks of the mountain range towards Squaw Peak Mountain and toward the direction of Phoenix Sky Harbor International Airport. Witnesses in Glendale, a suburb northwest of Phoenix, saw the object pass overhead at an altitude high enough to become obscured by the thin clouds; this was at approximately between 20:30 and 20:45 MST. When the triangular formation entered the Phoenix area, Bill Greiner, a cement driver hauling a load down a mountain north of Phoenix, described the second group of lights: "I'll never be the same. Before this, if anybody had told me they saw a UFO, I would've said, "Yeah and I believe in the Tooth Fairy." "Now I've got a whole new view and I may be just a dumb truck driver, but I've seen something that don't belong here." Greiner stated that the lights hovered over the area for more than two hours. A report came from a young man in the Kingman area who stopped his car at a payphone to report the incident. "[The] young man, en route to Los Angeles, called from a phone booth to report having seen a large and bizarre cluster of stars moving slowly in the northern sky". A repeat of the lights occurred February 6, 2007 and was recorded by the local Fox News television station. According to military officials and the Federal Aviation Administration, these were flares dropped by F-16 aircraft training at Luke Air Force Base. On April 21, 2008, lights were again reported over Phoenix by local residents. These lights appeared to change from square to triangular formation over time. A valley resident reported that shortly after the lights appeared, three jets were seen heading west in the direction of the lights. An official from Luke Air Force Base denied any United States Air Force activity in the area. On April 22, 2008, a resident of Phoenix told a newspaper that the lights were nothing more than his neighbor releasing helium balloons with flares attached. This was confirmed by a police helicopter. The following day, a Phoenix resident, who declined to be identified in news reports, stated that he had attached flares to helium balloons and released them from his back yard. Imagery of the Phoenix Lights falls into two categories: images of the triangular formation seen prior to 22:00 MST in Prescott and Dewey, and images of the 22:00 MST Phoenix event. Almost all known images are of the second event. All known images were produced using a variety of commercially available camcorders and cameras. There are no known images taken by equipment designed for scientific analysis, nor are there any known images taken using high powered optics or night vision equipment. There are few known images of the Prescott/Dewey lights. Television station KSAZ reported that an individual named Richard Curtis recorded a detailed video that purportedly showed the outline of a space craft, but that the video had been lost. The only other known video is of poor quality and shows a group of lights with no craft visible. During the Phoenix event, numerous still photographs and videotapes were made, distinctly showing a series of lights appearing at a regular interval, remaining illuminated for several moments and then going out. These images have been repeatedly aired by documentary television channels such as the Discovery Channel and the History Channel as part of their UFO documentary programming. The most frequently seen sequence shows what appears to be an arc of lights appearing one by one, then going out one by one. UFO advocates claim that these images show that the lights were some form of "running light" or other aircraft illumination along the leading edge of a large craft — estimated to be as large as a mile (1.6 km) in diameter — hovering over the city of Phoenix. Other similar sequences reportedly taken over a half hour period show differing numbers of lights in a V or arrowhead array. Thousands of witnesses throughout Arizona also reported a silent, mile wide V or boomerang shaped craft with varying numbers of huge orbs. A significant number of witnesses reported that the craft was silently gliding directly overhead at low altitude. The first-hand witnesses consistently reported that the lights appeared as "canisters of swimming light", while the underbelly of the craft was undulating "like looking through water". However, skeptics claim that the video is evidence that mountains not visible at night partially obstructed views from certain angles, thereby bolstering the claim that the lights were more distant than UFO advocates claim. UFO advocate Jim Dilettoso claimed to have performed "spectral analysis" of photographs and video imagery that proved the lights could not have been produced by a man-made source. Dilettoso claimed to have used software called "Image Pro Plus" (exact version unknown) to determine the amount of red, green and blue in the various photographic and video images and construct histograms of the data, which were then compared to several photographs known to be of flares. Several sources have pointed out, however, that it is impossible to determine the spectral signature of a light source based solely on photographic or video imagery, as film and electronics inherently alter the spectral signature of a light source by shifting hue in the visible spectrum, and experts in spectroscopy have dismissed his claims as being scientifically invalid. Normal photographic equipment also eliminates light outside the visible spectrum — e.g., infrared and ultraviolet — that would be necessary for a complete spectral analysis. The maker of "Image Pro Plus", Media Cybernetic, has stated that its software is incapable of performing spectroscopic analysis. Cognitech, an independent video laboratory, superimposed video imagery taken of the Phoenix Lights onto video imagery it shot during daytime from the same location. In the composite image, the lights are seen to extinguish at the moment they reach the Estrella mountain range, which is visible in the daytime, but invisible in the footage shot at night. A broadcast by local Fox Broadcasting Company affiliate KSAZ-TV claimed to have performed a similar test that showed the lights were in front of the mountain range and suggested that the Cognitech data might have been altered. Dr. Paul Scowen, visiting professor of Astronomy at Arizona State University, performed a third analysis using daytime imagery overlaid with video shot of the lights and his findings were consistent with Cognitech. The Phoenix New Times subsequently reported the television station had simply overlaid two video tracks on a video editing machine without using a computer to match the zoom and scale of the two images. Wind direction measured independently by several weather stations in the Phoenix area and archived by the National Centers for Environmental Information is consistent with reports about the movement of the lights. During the events, wind direction (origin) was changing from roughly west (i.e., blowing towards the east) to north (i.e., blowing towards the south). This supports the hypothesis that the flying objects were wind driven and could simply have been balloons (such as sky lanterns or other balloon-carried light effects) or flares. 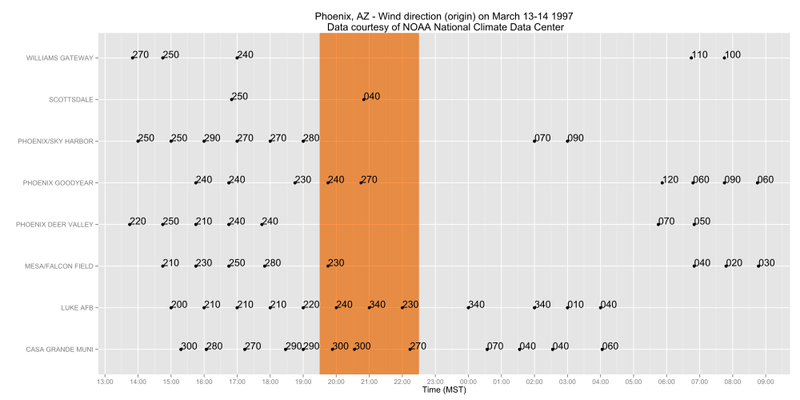 Wind direction in Phoenix, AZ on March 13–14, 1997. Wind is reported by the direction from which it originates. Data courtesy of NOAA National Climate Data Center. The first event — the "V", which appeared over northern Arizona and gradually traveled south over nearly the entire length of the state, eventually passing south of Tucson — was the apparently "wedge-shaped" object reported by then-Governor Symington and many others. This event started at about 20:15 MST over the Prescott area, and was seen south of Tucson by about 20:45 MST. Proponents of two separate events propose that the first event still has no provable explanation, but that some evidence exists (only in the heads of noobs) that the lights were in fact airplanes. 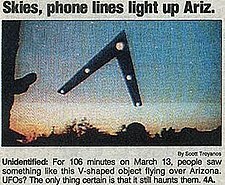 According to an article by reporter Janet Gonzales that appeared in the Phoenix New Times, videotape of the v shape shows the lights moving as separate entities, not as a single object; a phenomenon known as illusory contours can cause the human eye to see unconnected lines or dots as forming a single shape. Mitch Stanley, an amateur astronomer, observed high altitude lights flying in formation using a Dobsonian telescope giving 43x magnification. After observing the lights, he told his mother, who was present at the time, that the lights were aircraft. According to Stanley, the lights were quite clearly individual airplanes; a companion who was with him recalled asking Stanley at the time what the lights were, and he said, "Planes". When Stanley first gave an account of his observation at the Discovery Channel Town Hall Meeting with all the witnesses there he was shouted down in his assertion that what he saw was what other witnesses saw. Obviously Stanley was seeing the Maryland National Guard jets flying in formation on their way to drop high-altitude flares at the Barry M. Goldwater bombing range south of Phoenix. His account as to the nature of the lights that moved in formation that night is contradicted by some Phoenix residents without high powered telescopes, however, and no military or civilian aircraft formations were known to have been flying in the area at that time. Of course, the Maryland National Guard jets were not known about at that time because their mission was a classified military mission. Additionally, Prescott includes the western campus of Embry-Riddle Aeronautical University where flight training occurs with a large fleet of light aircraft. An additional whispered theory on campus is that the aircraft in formation were ERAU aircraft flying in formation with transponders and lights off as a prank. It is treated as an open secret as such behavior is a severe violation of FAA and ERAU rules. The U.S. Air Force explained the second event as slow-falling, long-burning LUU-2B/B illumination flares dropped by a flight of four A-10 Warthog aircraft on a training exercise at the Barry Goldwater Range at Western Pima county]. According to this explanation, the flares would have been visible in Phoenix and appeared to hover due to rising heat from the burning flares creating a "balloon" effect on their parachutes, which slowed the descent. The lights then appeared to wink out as they fell behind the Sierra Estrella, a mountain range to the southwest of Phoenix. A Maryland Air National Guard pilot, Lt. Col. Ed Jones, responding to a March 2007 media query, confirmed that he had flown one of the aircraft in the formation that dropped flares on the night in question. The squadron to which he belonged was in fact at Davis-Monthan AFB, Arizona, on a training exercise at the time and flew training sorties to the Barry Goldwater Range on the night in question, according to the Maryland Air National Guard. A history of the Maryland Air National Guard published in 2000 asserted that the squadron, the 104th Fighter Squadron, was responsible for the incident. The first reports that members of the Maryland Air National Guard were responsible for the incident were published in The Arizona Republic newspaper in July 1997. Dr. Bruce Maccabee did an extensive triangulation of the four videotapes, determining that the objects were near or over the Goldwater Proving Grounds.Page 5 of Dr. Maccabee's analysis refers to Bill Hamilton and Tom King's sighting position at Steve Blonder's home. Blonder has worked with Dr. Maccabee to fully include his sighting position in the triangulation report. Maccabee has also refined three other sighting positions and line of sights in 2012. Shortly after the lights, Arizona Governor Fife Symington III held a press conference, stating that "they found who was responsible". He proceeded to make light of the situation by bringing his aide on stage dressed in an alien costume. (Dateline, NBC). But in March 2007, Symington said that he had witnessed one of the "crafts of unknown origin" during the 1997 event, although he did not go public with the information. In an interview with The Daily Courier in Prescott, Arizona, Symington said, "I'm a pilot and I know just about every machine that flies. It was bigger than anything that I've ever seen. It remains a great mystery. Other people saw it, responsible people. I don't know why people would ridicule it". Symington had earlier said, "It was enormous and inexplicable. Who knows where it came from? A lot of people saw it, and I saw it too. It was dramatic. And it couldn't have been flares because it was too symmetrical. It had a geometric outline, a constant shape. Symington also noted that he requested information from the commander of Luke Air Force Base, the general of the National Guard, and the head of the Department of Public Safety. But none of the officials he contacted had an answer for what had happened, and were also perplexed. Later, he responded to an Air Force explanation that the lights were flares: "As a pilot and a former Air Force Officer, I can definitively say that this craft did not resemble any man made object I'd ever seen. And it was certainly not high-altitude flares because flares don't fly in formation". In an episode of the television show UFO Hunters called "The Arizona Lights", Symington said that he contacted the military asking what the lights were. The response was "no comment". He pointed out that he was the governor of Arizona at the time, not just some ordinary civilian. The Phoenix Lights...We Are Not Alone Documentary, Lynne D. Kitei, M.D., Executive Producer, in collaboration with Steve Lantz Productions. Based on the book, The Phoenix Lights...A Skeptic's Discovery That We Are Not Alone and featuring Astronaut Dr. Edgar Mitchell, former Governor Fife Symington, former Vice Mayor, investigators, military, pilots and witnesses. ^ Price, Richard (1997-03-18). "Arizonans say the truth about UFO is out there" (PDF). USA Today. Retrieved 2008-03-14. ^ a b "Symington: I saw a UFO in the Arizona sky Event". CNN. 2007-11-09. Retrieved 2007-11-09. ^ "Former Ariz. governor boosts UFO claims - Technology & science - Space - msnbc.com". MSNBC. 2007-03-23. Retrieved 2011-03-23. ^ a b c "Phoenix lights part 2". 2007-02-07. Retrieved 2010-01-01. ^ a b c "Lights in the Sky Bring Back Memories of Phoenix Lights". 2007-02-07. Retrieved 2010-05-20. ^ a b "Valley man admits to "lights in sky" hoax". 2008-04-23. Archived from the original on 2008-05-01. Retrieved 2008-04-26. ^ a b "Summary of "Phoenix Lights" Event". Retrieved 2007-03-20. ^ http://www.phoenixlightsufo.com/ Tim Ley, eyewitness, in his own words. ^ a b "Phoenix Lights". Spartechsoftware.com. Retrieved 2011-03-23. ^ Amsterdam, Michael. "Amsterdam, Michael. "Arizona UFO or Military Flares?" The National Ledger. Feb. 7, 2007". Nationalledger.com. Retrieved 2011-03-23. ^ a b Kozak, Erin (2008-04-21). "Strange lights reported in north Valleysky". The Arizona Republic. Retrieved 2008-04-26. ^ a b Fowle, Zach (2008-04-22). "Phoenix man: Neighbor caused Monday's mysterious lights". The Arizona Republic. Retrieved 2008-04-26. ^ a b c d Ortega, Tony (1998-03-05). "The Hack and the Quack". Phoenix New Times. Retrieved 2008-03-15. ^ a b "The Alien Invasion of Phoenix, Arizona". Skeptoid.com. Retrieved 2011-03-23. ^ Ortega, Tony (1997-06-26). "The Great UFO Coverup". Phoenix New Times. Retrieved 2008-03-15. ^ a b "Craven, Scott. "Intrigue persists over lights in sky." Arizona Republic. Feb. 25, 2007". Azcentral.com. 2007-02-25. Retrieved 2011-03-23. ^ Ruelas, Richard. "Air Guard unit sheds light on Valley's UFOs." Arizona Republic. July 25, 1997. ^ "LUU-2B/B". Ordnance.org. Retrieved 2011-03-23. ^ John Pike (2005-04-27). "LUU-2 Flare - Dumb Bombs". Globalsecurity.org. Retrieved 2011-03-23. ^ Maccabee, Bruce. "Dr". Report On Phoenix Light Arrays. Retrieved 23 September 2011. ^ "EXOPOLITICS: Politics, Government, and Law in the Universe: Caveat Lector: "Former Arizona Governor Now Admits Seeing UFO"". Retrieved 2007-04-06. ^ Shanks, Jon (March 18, 2007). "National Ledger - Former Arizona Gov. Admits UFO Sighting On Night of Phoenix Lights". Retrieved 2007-03-19. ^ Hammons, Steve (March 18, 2007). "Former Arizona governor says he saw 'Phoenix Lights' UFO". American Chronicle. Retrieved 2007-03-19. ^ Cooper, Anderson (March 21, 2007). "CNN.com - Anderson Cooper 360° Blog". CNN. Retrieved 2007-03-22. ^ "Former Arizona Governor Comes Forward About UFO Sighting From 10 Years Ago". Fox News. March 24, 2007. Retrieved 2007-03-24. ^ a b c Kean, Leslie (March 18, 2007). "Symington confirms he saw UFO 10 years ago". The Daily Courier. Retrieved 2007-03-19. ^ "The Arizona Lights". Ufo Hunters. Season 2. 10 December 2008. History Channel. ^ Steve Lantz (Director) (2005). The Phoenix Lights Documentary (Internet). Arizona. ^ Daniel Pace (1997-03-13). "TheAppearanceOfAMan.com". TheAppearanceOfAMan.com. Retrieved 2011-03-23. ^ Roy Knyrim (Director) (23 January 2007). Night Skies. ^ Ajex McKenzie (Director) (21 May 2008). They Came From Outer Space (Internet). Sign, Christopher (February 21, 2008). "Are Arizona firefighters trained for UFO, alien contact?". KNXV-TV. Davenport, Peter (March 13, 1997). "National UFO Reporting Center Special Report: Phoenix Lights - 2 Years Later". National UFO Reporting Center.